To make the hibiscus powder: In a food processor, add the chopped hibiscus flowers, dried epazote, dried oregano, chiles de arbol, 1 tablespoon flour, 2 teaspoons of the salt and the black pepper. Pulse until completely ground. Incorporate the lime and orange zest, pulse again until mixed. Set aside. Fill a large heavy cast iron pan or casserole halfway with oil set over medium heat to preheat. Meanwhile, spread 1 cup of flour on a baking sheet. Rinse the fish and pat dry very well. Using a sharp knife, make 3 to 4 diagonal slices into both sides of the fish, going into the skin and meat, but stopping at the bones. Reserve 3 tablespoons of the hibiscus powder and set aside. 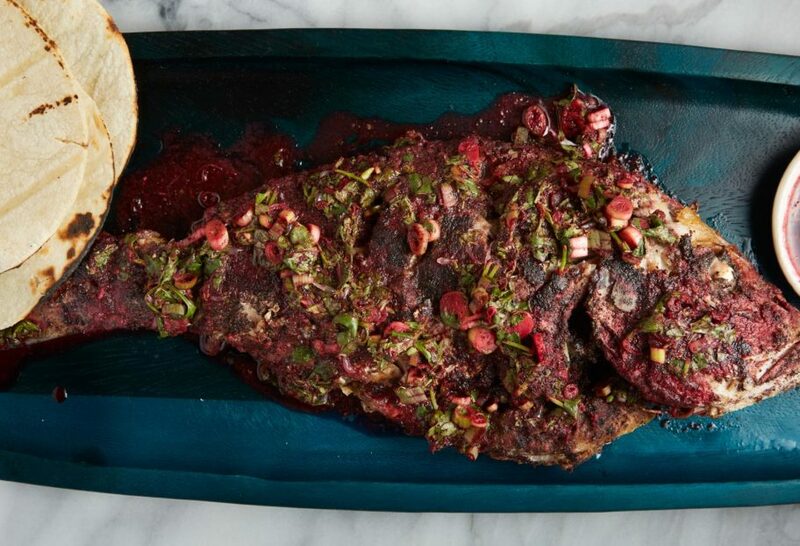 Use the remaining hibiscus powder to season inside of the slices and over the fish. Then, one by one, place the seasoned fish on the baking sheet and pat them with the flour, giving them a light coat. Test the oil with a small piece of fish to make sure that it will actively bubble around the fish. Then, one by one or two by two, without crowding the pan, drop in the fish and fry for 6 to 8 minutes per side, making sure that it is completely cooked – the meat should flake with a fork. Transfer to a cooling rack or a cutting board covered with paper towel. Once you are done with all the fish, and they have drained, place on a large platter. To make the hibiscus citrus chunky, chunky sauce: Combine the 3 reserved tablespoons of hibiscus powder, the lime juice, orange juice, and ½ teaspoon of the salt in a small mixing bowl. Stir and add the scallions and cilantro, mix well. Taste and add more salt if need be. Serve the fish along with the hibiscus citrus chunky, chunky sauce and warm corn tortillas. Where is a good place to order these spices? Living in North Carolina and there is no! Source for Mexican spices of food. At Xmas I had to order corn husks for my tamales nobody stocked them here!! Oh there are lots of great places online like Melissa’s Produce. Enjoy the fish, Bob! Were the scales removed from the fish? Yep! You want a whole, cleaned fish, so de-scaled and everything.